This pattern is part of The Chevron Collection. With front and back pieces shaped to fit a woman’s figure, this high waisted feminine cardigan makes a great addition to any wardrobe. 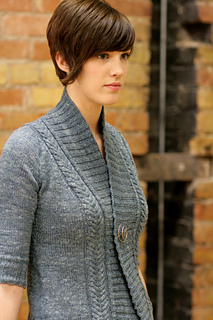 Knit it in a smooth wool for a more refined style, or a tweedy yarn for a more relaxed feel. 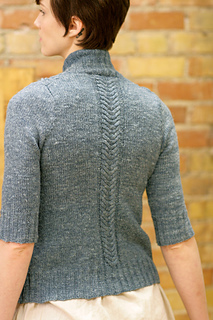 The plaited cables wrap over the shoulders and the shoulder seams are moved to the back instead of on top of the shoulders. 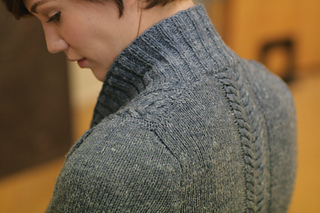 This sweater is knit in pieces from the bottom up and seamed together. 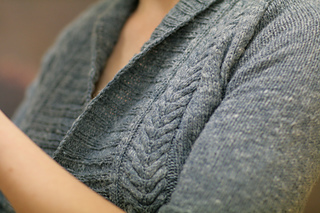 The front bands and collar are knitted on as one piece after the rest of the sweater is sewn together. This sweater is meant to be worn with 1-2” of positive ease. The narrowest point of the sweater will hit a high waist. From the hem to the waist, all shaping is done on the back piece, while all shaping above the high waist is done on the fronts of the cardigan. This will give the sweater fullness where it’s needed (on the back near the hemline and on the front at the bust). Bust sizes 32 36, 40, 44, 48, 52, 56 inches (81 91.5, 101.5, 112, 122, 132, 142.5cm) requiring 1025 1150, 1275, 1400, 1550, 1675, 1800 yards of DK weight yarn. Stitches Used: knit, purl, k2tog, yo, sl, ssk, kfb, c3 over 3 right and c3 over 3 left with full instructions included in pattern.